I recently had a client of mine ask me how they could report new and retained visitors for their website. In this particular case, the site had an expectation that the same visitors would return regularly since it is a subscription site. At first, my instinct was to use the Cohort Analysis report in Adobe Analytics Workspace, but that only shows which visitors who came to the site came back, not which visitors are truly new over an extended period of time. 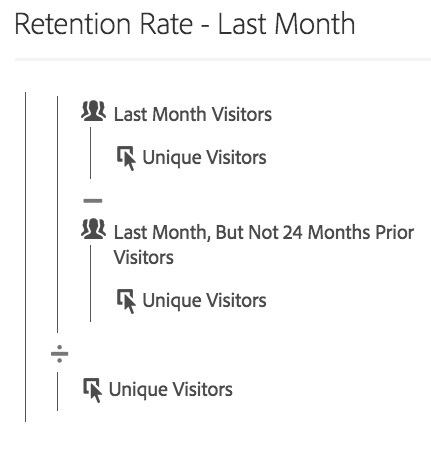 In addition, it is not possible to add Unique Visitors to a cohort table, so that rules this option out. What my client really wanted to see is which visitors who came this month, had not been to the site in the past (or at least past 24 Months) and differentiate those visitors from those who had been to the site in the past 24 months. While I explained the inherent limitation of knowing if visitors were truly new due to potential cookie deletion, they said that they still wanted to see this analysis assuming that cookie deletion is a common issue across the board. While at first, this problem seemed pretty easy, it turned out to be much more complex that I had first thought it would be. The following will show how I approached this in Adobe Analytics Workspace. 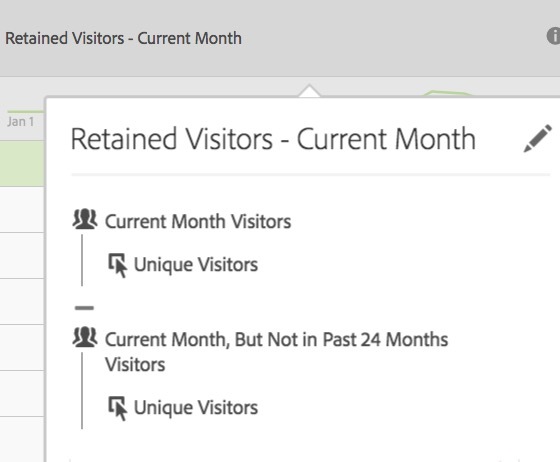 To save space, I have omitted the raw count of Retained Visitors and am just showing the retention rate, which for last month was 7.42% vs. 10.82% for the current month. 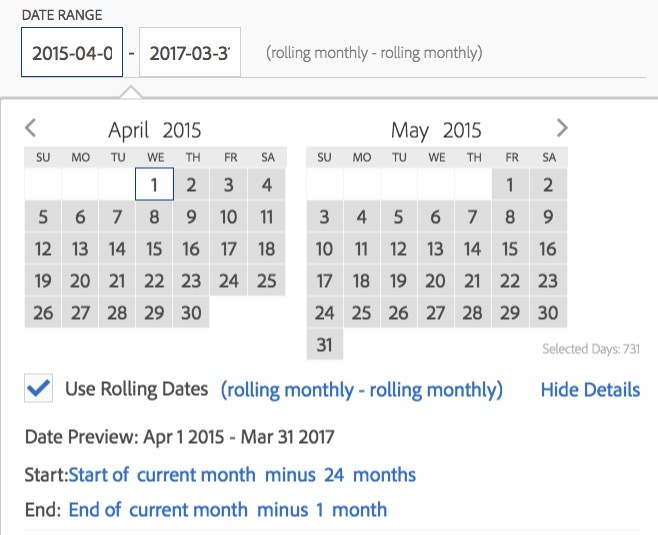 To summarize, the new features Adobe has added to Analysis Workspace, including Rolling Dates, open up more opportunities for analysis. 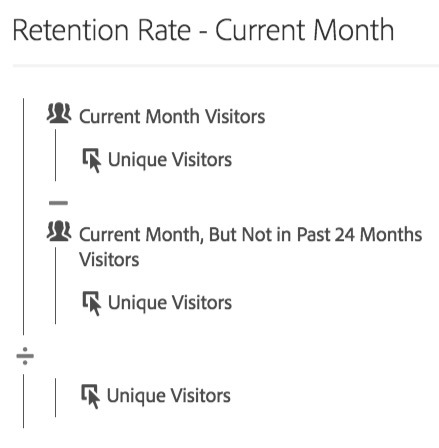 To view rolling visitor retention, you may need to create a series of distinct segments/metrics, but in the end, you can find the data you are looking for. If you have any ideas or suggestions on different/easier ways to perform this type of analysis in Adobe Analytics, please leave a comment here. I actually was thinking to create a additional calculated metrics to gather all the different calculated metrics but I blocked at the first step. There is no time frame : Last 24 Month on my Adobe Account. Is it something for premium users ? 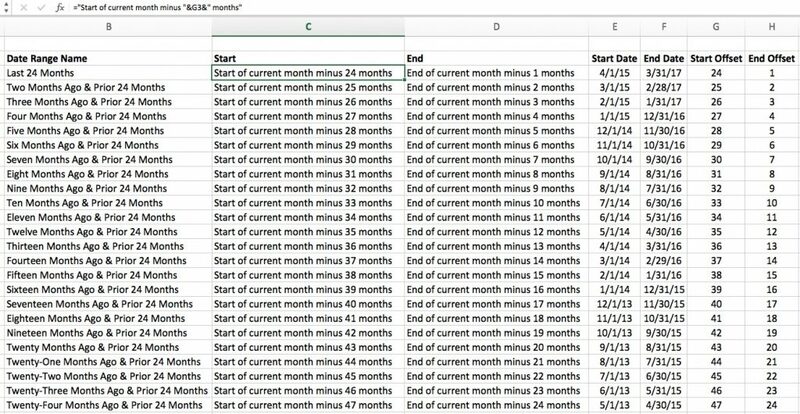 I just created a calculated metrics that gather all the one that have been created before, therefore you can have all the different retention rate in one column and the month in row. 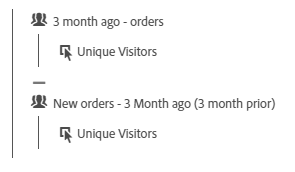 I also added another variant by created a segment for people that realized an orders, so I have a retention rate of visitors that realized an order. This will be super useful for our reports. Feel free to attach screenshots here! 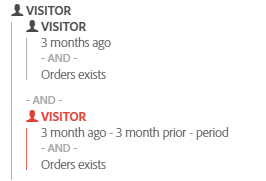 For getting the visitor that realized an order, I created the same segments that you did with adding the Orders as a condition. You may have to share an entire blog post about this so I can fully understand what you are doing here! Hello Adam, you mean on analyticsdemystified.com ?